Pebble Creek Ski Area is celebrating 70 years of skiing with a Torch Light Parade Saturday, February 16. All past, present and future skiers are welcome to join the celebration! To kick off the celebration on Friday, February 17, Barrie’s Ski and Sports in Pocatello is hosting a 70th Anniversary sale. The sale begins at 7:00 pm and the 70th purchasing customer will win a free Pebble Creek 5-Day Book! There will also be several opportunities to win night and day tickets to Pebble Creek in addition to the many items on sale at Barrie’s. On Saturday at the mountain, Local musicians, McCaffrey Jones will be performing upstairs in the lodge beginning at 5:00 pm providing music for dancing. 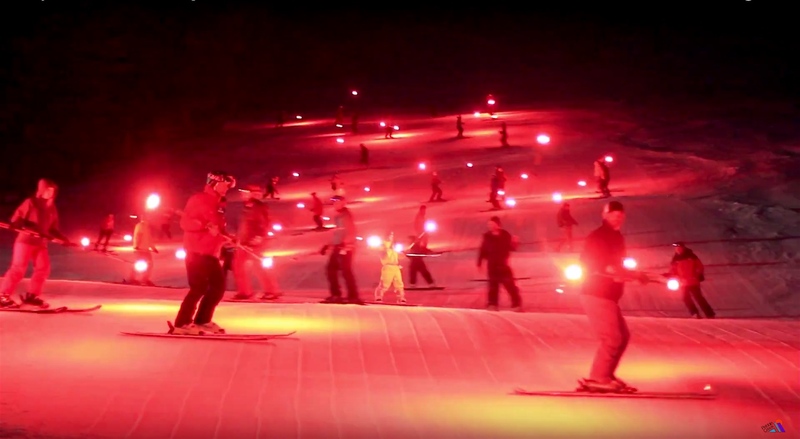 Then watch as the Pebble Creek staff and guests ski down with torches. The Torchlight Parade is a spectacular event visible from the lodge deck, winding down from the Sunshine Lift. Torches to ski with can be purchased for $10 and anyone interested in participating must be an expert skier and at least 18 years old. Saturday night will also be open for night skiing. The discount night ski tickets will be at Barrie’s, otherwise night ski lift tickets can be purchased at the ticket window. Food Service, Rental Shop and the Rock Bottom Saloon will all be open with several fun food and drink specials. There is no charge for the 70th Celebration or watching the Torchlight Parade.